4 questions on "Imagining the Kingdom." Part 2 of ITK describes what liturgy "does": it immerses us in a communal narrative, "not only inform[ing] the intellect but reform[ing] the very praktognosia by which we 'feel' our way around the world." Liturgy gives substance and direction to our embodied desires, affections, and loves. Importantly, Christian worship is not the only practice that fits this description. Indeed, Smith makes a major point of construing many constellations of practices and dispositions—many liturgies—as doing the same work of formation, in competition with Christian faith. Individualistic, consumeristic, nationalistic, and other ways of being-in-the-world shape us (and our congregants and students) against the gospel and the kingdom. Smith's urgent recommendation to pastors, teachers, and worship leaders is to realize that this competition is being fought at levels and in modes hardly limited to conscious, reflective thought. On the whole, we agree. Yet it would be easy to get the impression from Smith that the solution is simply to expose people, consistently and intensively, to the right liturgy: that Christian worship by itself—if practiced often enough to "seep into the bones"—forms a deeply Christian person (indeed a deeply Christian community). But Christian experience is surely more complex than this. We may show up in the pews week after week, participate in fellowship, listen to the Word, feed on the body and blood of Jesus as we receive his promises—and still be capable of remarkable feats of compartmentalization. We can do all of the above, passionately and gratefully, every Sunday for decades, and just as routinely pick up our ways of unbelief, despair, and alienation again on Monday. A Christian liturgical anthropology cannot ignore the infuriating, confusing, corrosive dynamics of sin and brokenness, dynamics that regularly frustrate and demoralize the most dedicated Christian pastors and educators. Who's in Charge of Worship? Attention to sin and to fallen creatures' need for the Holy Spirit is understated in ITK's exploration of worship. Instead, Smith focuses on humans' formation via the liturgies of our daily lives; he emphasizes habituation rather than the unplanned gifts and interventions of the Spirit. (Reviewers of Smith's DTK have also flagged neglect of the Spirit's role and related overstatement of human agency in overpowering sin.) While Smith alerts us to the important role that liturgies (whether sacred or secular) play in identity formation and even worldview, he could offer a clearer picture of what worship itself is or does. The book as a whole purports to show "how worship works," yet readers may leave wondering which view of worship Smith is describing and/or espousing. In his more optimistic moments, Smith lauds the possibilities of worship: e.g., he equates the "end of worship" with the "end of Christian education"—i.e., a sending out for action, a vocational call and response. "We are (re)made to be makers," he claims, and he later reiterates that "the end of worship is mission … we gather to be sent." Yet Smith seems haunted by the "paralyzing" realities of 21st-century practices such as the habitual use of social media, both enabling and encouraging self-display. Since he defines humans as "creatures who can't not worship," he stresses that we are shaped by cultural liturgies of many kinds, some far from holy. Perhaps because Smith's view of liturgy includes a wide variety of practices (from tweeting to hymn singing), his definition of worship seems torn between the actual and the ideal. 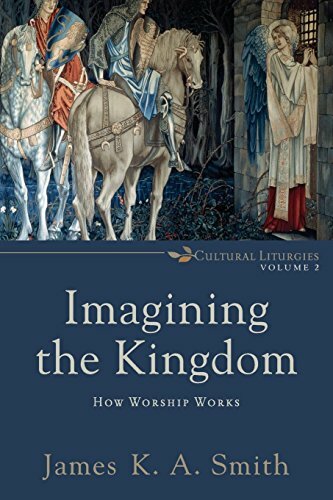 What is clear about Smith's view of worship is that it relies heavily on imagination—hence, the book's title and theme. He describes imagination as "a kind of faculty by which we navigate and make sense of our world"—imagination serves as both pilot and interpreter. In developing his liturgical anthropology, Smith invokes Augustine, Aristotle, and others to argue for the role of the senses in "knowing" the world via experience and image. He builds a case for the centrality of story in Christian life and influence, titling his final chapter "Restor(y)ing the World: Christian Formation for Mission." Readers may be reminded of debates on the scope and application of "worldview"; indeed, in one of Smith's attempts to "picture" his argument throughout the book with asides boxed in gray, he invites readers to pray a worldview in order to absorb its story "in [the] bones."